Decided I’d take a break from all the informationally exhaustive posts lately, and do a review on the Mad Hippie Vitamin C Serum. A little background information: I’ve been trying to incorporate an Ascorbic Acid Vitamin C serum back into my routine, but have found many of them quite irritating and somewhat drying. Decided I might as well try a Sodium Ascorbyl Phosphate variation because they’re gentler on the skin and provide similar benefits. Began investigating, located one with the proper pH and some kickass ingredients. Took the splurge, and viola — enter the Mad Hippie Vitamin C Serum into my life. Let’s start analyzing this serum from one of my favorite, but less important aspects: the smelly smell. 2.1 10% Vitamin C (Sodium Ascorbyl Phospate). It’s not unbearable or overwhelming in the slightest, quite the opposite — calming, soothing, relaxing. I look forward to applying it morning and night because of the de-stressing effect it gives me. It’s probably my favorite product as far as scents go. I hear yuh. Let me explain. 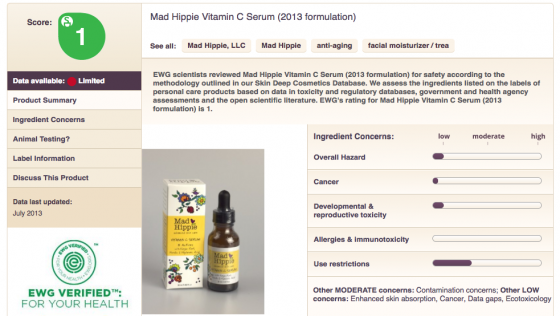 Not that I’m crazy about them, but If by any chance you’re a fan of the Environmental Working Group (EWG) ratings, you’ll be happy to learn that this serum has the highest safety profile of any Vitamin C serum analyzed on their website. 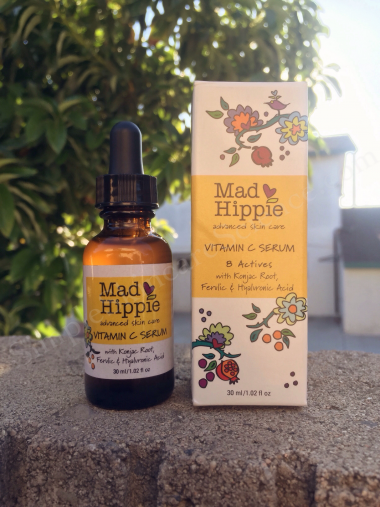 90% of the ingredients score a 1 on a scale of 10 (the lowest toxicity rating possible), and the remaining 10% of ingredients score a 2 — giving Mad Hippie’s Vitamin C Serum no hazards and the highest safety profile. With that said, here’s the full ingredient list. As you may know, everyone approaches skincare differently. What works brilliantly for some, might not for others. “YMMV” as they say. There are a many ways of reaching the end goal of clear radiant skin. For me, it means taking the minimalist approach when possible. The less unnecessary filler ingredients I see in a product, the higher it ranks in my opinion. This is not to say ingredient dense products are bad. In fact, they could work wonders. But given my sensitivities, redness, and extremely clog-prone skin I prefer short ingredient lists with maximum efficacy. It’s simply a matter of preference. 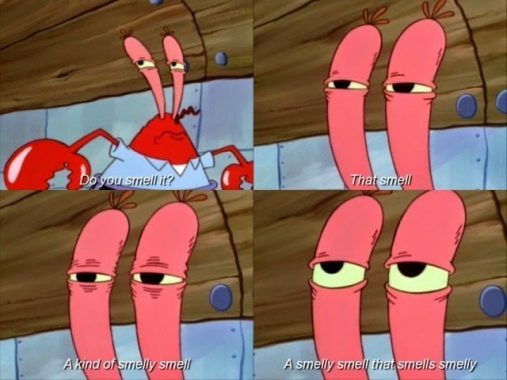 My line of thinking is that the more ingredients a product has, the higher likelihood it may cause a problem for those with extremely problematic skin like myself. And this is why I really appreciate the Mad Hippie Vitamin C Serum — it’s minimal but packs a punch. Let’s break down the beneficial ingredients in the formula. 10% Vitamin C (Sodium Ascorbyl Phospate). Sodium ascorbyl phospate (SAP) is the most stable and bioavailable form of Vitamin C. It’s a highly effective active ingredient, and one of the safest and gentlest currently available. Unlike Ascorbic Acid, it doesn’t oxidize quickly meaning it has a longer shelf life, making it a particularly favorable ingredient to use in cosmetic formulations. However, there’s been more research done on Ascorbic Acid than SAP, and the benefits of Ascorbic Acid are plentiful and undeniable. So why would you want to use SAP instead? Ascorbic Acid requires an inherently low pH to work which could be irritating if you don’t have hardy skin or are accustomed to chemical exfoliates. Overdoing it with low pH serums or chemical exfoliates will set you back in progress not help. 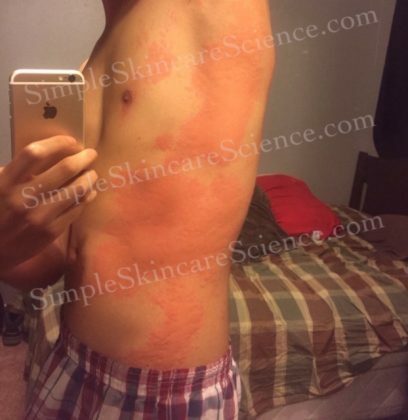 So if your skin is easily irritated, then you might want to opt out for an SAP vitamin c serum instead. I’ve said this before, but more is not necessarily better. In skincare, less is more. Patience trumps impulsiveness. The idea is to play the waiting game. Have the willpower to use less, and not jump the gun. That’s how you’ll see the most progress. With that said, if you’re impulsive like me when it comes to skincare then SAP is your best friend. You don’t have to introduce it slowly and can start using it twice daily without experiencing any side effects whatsoever. Thus, results occur quickly and include brighter skin, more even skin tone, reduction in pigmentation issues, and acne clearing. 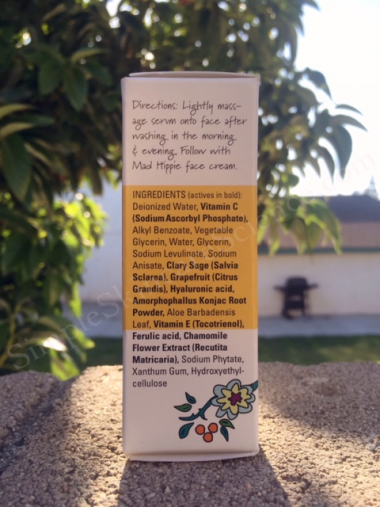 In case you’re interested, here’s what Mad Hippie had to say about the SAP vs. Ascorbic Acid ordeal. A natural ingredient as old as your great great grandmother x 10. It’s been used as a multipurpose skin treatment for over 3,500 years. For most people, it’s the thing to use after a horrible sunburn. Another humectant that hydrates the skin by drawing water from the environment. This comes from a nutritionally dense medicinal plant from southeast Asia and China. It has a ton of vitamins and minerals including A, E, C, D, B, copper, magnesium, iron, niacin, zinc, folic acid etc. It’s healing properties have been used in Japan for 1,500 years. In cosmetics it’s used as a natural alternative to carbomer to create a gel-like consistency that forms a thin barrier on the skin. It’s also the ingredient used to make konjac sponges in case anyone’s wondering. Antioxidant, antifungal, and secondary preservative. May have natural and gentle exfoliating properties. Gentle herb that contains flavonoids (plant compounds with antioxidant effects), and great for sensitive skin. It’s soothing, has anti-inflammatory properties, inhibits free radical synthesis, and is a remarkable vasodilator (i.e. increases blood flow to skin). Has antioxidant and antimicrobial properties, (40) and probably what gives this serum it’s lovely scent. (41) Mad Hippie says it balances oil production and acts as a natural toner too, but take that information with a grain of salt. I personally like my serums to have a bit of “slip” to them. It makes it easier to apply and spread across the face with less product. In my experience I’ve found watery serums to be more drying as well. These days I try to avoid irritation and stay hydrated whenever possible, so avoiding anything that causes excess dryness is a plus. The Mad Hippie Vitamin C Serum meets all these requirements. As you can see it’s runny, has a bit of slip to it, sinks in nicely, dries matte, and leaves a slight tacky feeling (not a big fan of this). It’s non-drying, and the addition of hyaluronic acid and glycerin provide an additional boost of moisture which is great. It layers well under products, and I’ve yet to encounter a problem mixing it with other serums, moisturizers, or spot treatments. I said this already but the smell is subtle and absolutely divine too, making the application process all the more enjoyable. The serum can be used twice daily without irritation. Simply apply a few drops on the palm on your hand or face and spread evenly. Because SAP is pH dependent (6-7) the placement of it in your routine matters. Here’s a sample skincare routine showing it’s placement with all things being considered. Depending on what you’re using some of these steps may not apply so adjust it accordingly. A ton of great stuff here including 10% Vitamin C (SAP), Vitamin E, Ferulic Acid, Hyaluronic Acid, Chamomile Extract. Clary Sage, and Konjac Root Powder. Acne fighting, skin lightening, hyperpigmentation reducing, photoprotective, and extremely gentle. Has a lot of slip, spreads easily, dries matte, leaves a slight tacky feeling, and smells great! Well, you saw the pictures! The bottle and box are lovely. Because oxidation is not an issue here, the dropper dispenser works fine. It’s decently priced but starting to verge on the slightly more expensive side of things ($27). Very few Vitamin C (SAP) serums are formulated this well or with proper pH. It’ll probably remain a stable in my routine unless I find something better in the future. For now, I’ll continue alternating between this and Ascorbic Acid variations every couple months. Hope you’ve enjoyed this review! 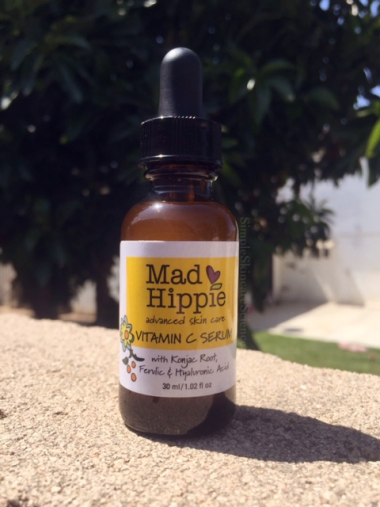 Tell you friends about the Mad Hippie C Serum! I want to note it is REALLY important to let vitamin C sit on the skin for 5-15 minutes before layering anything else on top. You mention this in the How To Use steps to wait 20-30 minutes for low pH acids, and thank you for that (I appreciate your knowledgeable, science-based approach to skincare so much), but I’ve got to emphasize just how important that tiny detail is. I am not using any other treatments, so my Ascorbic Acid serum goes on right after cleansing and before a moisturizer. It is my Holy Grail for acne! But I went through a months-long debacle with it, wondering why my skin would clear up and then break out again. 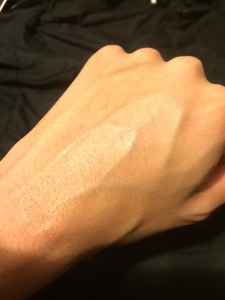 I finally figured it out: I was being impatient and applying moisturizer directly after my vitamin C. It was jacking up the pH and preventing it from working! Once I understood that and let the serum sit for 10 minutes, all my acne cleared up in TWO DAYS. Everyone please make sure to give that vitamin C a few minutes to work its magic!!! My only question for this product is, isn’t Grapefruit sensitizing/potentially irritating? I’m considering this product as I have a very similar skin type as yours, I am just a bit obsessed with fragrance-free. I love your blog, and I hate to rain on your parade, but the scientific info here on the bioavailability and efficacy of SAP versus AA is straight up backwards, and people are consequently getting a misleading recommendation here. Note that last sentence, because it’s relevant to a bunch of research on these chemicals: Much of the research on SAP is only available in vitro—in cell cultures or tissue samples—which do not accurately represent the effects in vivo (living skin) because of the low penetration of SAP in skin compared to AA. “In other cultured human fibroblast experiments, MAP was found to be equivalent to AA in stimulating collagen synthesis, while SAP required at least a tenfold greater concentration to produce the same effect as AA.” Note that this is in cell culture, where skin penetration isn’t even a factor! Considering so much less SAP is getting across the skin, you would expect the discrepancy to be even worse in real life. Since the whitening effects of any AA-derivative also probably rely on conversion into AA in the skin, it is likely that there is a similar lower efficacy for whitening compared to AA. In short, SAP has skin benefits, but not nearly to the degree AA does and also not even to the degree that MAP does (a closely related salt with Magnesium instead of Sodium that is also very mild). If you can tolerate AA, it’s definitely the gold standard. If you can’t, you should probably try a MAP formulation instead, and consider SAP a last resort. Hi, great review! I just got my Vitamin c serum today and was very surprised ro see that it is kinda yellowish.. did yours come like that or is mine bad? Just got this serum. Is the serum supposed to be colorless? Mine was yellow..
How long did it take for you to see a significant change in your PIH with this serum? I’m super fair, and a ridiculous amount of PIH is my worst problem right now…so frustrating. I also have dry and sensitive skin. I didn’t realize it at first, but when I used vit C serum (LAA 15%), it felt like being over exfoliated after 2 days. Moreover, the sting sensation left my face red. But….its brightening properties made me love the product. I just came across your blog and it’s so great! I just purchased this C serum after reading through your posts. I can’t wait to use it but want to make sure I maximize its effectiveness. I’m currently using Tatcha products which includes an camellia cleansing oil, then a rice powder enzyme exfoliant, then a brightening serum and lastly a moisturizer. I’m not sure of the pH of these products and was wondering where the vitamin C comes into play. My guess is after my current serum. Do you think that would work? Or should I test the pH of my current products first? Thanks!! Hi, I loved your write up and been looking for a good vitamin C serum, I notice that Amara Organics has a serum that is 20percent vitamin c, I also notice it has more ingredients … I feel maybe less ingredients is better ..I like only the main needed ingredients to be in the product, . I am currently using Silk Therapeutics ..It a wonderful company and it’s also approved by e w g. The only issue is it’s not cheap.. I am hoping to find another serum that less money…. I just want you to know that Silk Therapeutics only has 5-7 ingredients in their products … very natural ,I just wish they were not so costly.. I will look into Mad Hippie…. Just wondering would you say this has a longer shelf life than L-AA as it’s stable? Would you recommend still using SAP within a certain time frame after opening it? Hey, newbie to skincare here. This was the first Vitamin C serum that I’ve tried and it seems to be breaking me out. I use Cerave’s hydrating cleanser and the Hada Labo lotion. I’ve tried layering the serum before or after the Hada Labo but my skin still reacts to it pretty badly. My skin seems to be just fine with the cleanser and lotion followed by my usual moisturizer. Hope you can shed some light on this problem. Thanks! I use this serum, and i thinks it good I suffer are lot with hair bumps under my chin and what i do is tweeze them out and it leave dark spots do you think useing the vitamin c serum will help clear up the dark spots. Thank you for your incredibly informative website! After taking Accutane 17 years ago, my skincare routine has slowly become non-existent. With the exception of a few facials and one bottle of Skinceuticals Retuxturizing Activator when I was pregnant with my first child and had a resurgence of hormonal acne, I’ve done almost nothing. I will be 32 next month and would really like to commit to more self-care. It seems like the top two things I should do to care for my skin in my 30s are to incorporate a Retinol and Vitamin C serum. Do Ascorbic Acid and Sodium Ascorbyl Phospate essentially deliver the same benefits to skin? I have combination skin with occasional breakouts tied to hormonal fluctuations and am most concerned about brightening, shrinking pores, and keeping up with preventive anti-aging care. LilyAna Naturals seems to have a nice SAP serum made in the USA, which really appeals to me. What are your thoughts? Hi! Your blog is so cool it inspired me to write down my own long and boring story of my primadonna skin. I didn’t use any skincare for the last two years, only the occasional moisturizer, so that my skin can catch a break from my madly incompetent routine that I had before. Now I thought I’d design a better, more informed skincare regime so I can fight some of the damage I’ve done. Firstly, I love the CeraVe PM and thanks to your blog now I know why 😀 I repurchased it (even after one application my skin feels better!) and I also ordered the Mad Hippie Vitamin C serum and now I’m wondering how to introduce the serum to my routine. I was thinking of staying with the CeraVe only for a whole month and then use both once daily. Do you have any hints here? 🙂 Also, I wonder if these two will help with my super annoying clogged pores/small bumps or I’ll need a BHA exfoliant? I love your review and really want to try this product. I would want to use this Vit C in the AM with my sunblock over it and then my makeup. Do you think this could work for that? I have oily acne prone skin. Also, in your how to use , Ive seen that you say to us BHA, AHA, and retinol. It is okay to use all of these together? 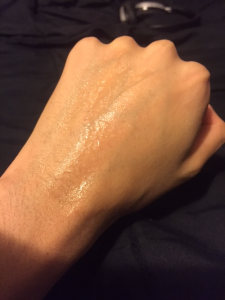 I have been using Tazorac (Retin A) the strongest form and have been alternating some nights with the drunk elephant TLC samples (BC its so expensive!) and looking for good AHA/BHA to use when I dont use retinol.